$20 General admission. RSVP for free cover before 11:30pm. Hosted cocktail Reception only with RSVP online w/ Alpha Entertainment Chicago. Free Before Midnight. $10 Reduced Cover After. 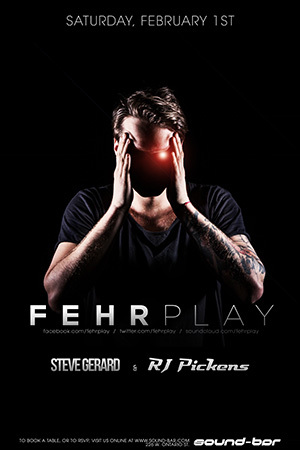 Fehrplay makes his appearance for the first time to Sound-Bar alongside locals Steve Gerard and RJ Pickens. Q: Why Are Featured Party Packages Free? A: Alpha Entertainment's Job Is To Bring People, Who Want To Party, At The Clubs Every Weekend. We Have Great Free Party Packages As A Perk To The Customer, To Help Us Do Our Job. Q: Do All Nightclubs Have Free Party Packages? A: Only Some Nightclubs Have Free Party Packages Available Though Us At These Venues. We Like To Get You The Best Deals Available. Sign Up To Keep Updated With Events And Other Specials. © 2019 Alpha Entertainment. All Rights Reserved.